Navigate the course and your scorecard by choosing the right golf GPS system for you. Golf GPS systems have evolved significantly since they were first introduced. No longer is the GPS device only meant to tell you about the distance to the hole and other parts of the approach. Now, high-end golf GPS devices can show you a full-color overview of the hole in order to let you identify potential areas on each hole to avoid. They also provide assistance with your overall golf course management with the goal of helping you lower your score over a round. Golf GPS devices have been legal per USGA (United States Golf Association) rules since 2005. Establish your overall budget for acquiring a golf GPS system. Beyond the bottom-line price, another issue to consider is whether you can afford a monthly subscription fee for GPS system updates for the system that you acquire. If you normally only play one or two local courses, then purchasing a monthly subscription may not prove worthwhile, whereas if you travel extensively the monthly cost will pay dividends. Decide whether you want a color GPS screen or black and white. Although most golfers prefer the look and feel of a color device, if you are only acquiring the product to determine the distance to the green or hole, a black and white device will suffice. Assess the annual or monthly membership fees required by the GPS service. Some devices that have a cheap up-front cost will charge a subsequently higher monthly or annual fee for access to golf course maps. Buying a unit that lets you opt out of paying the membership fee is another option to consider. If your local golf course is already loaded on the device, then this could be a way to get higher-end model without having to pay costly fees. Determine whether your regular golf courses are supported by the GPS device before you buy the unit. If you are buying the product on-line, take extra time and review the device in-person at your local golf or consumer electronics store if the company's website does not list the golf courses that are supported. You can also ask the golf pro at your local course what GPS models are supported there. He or she will know what other models the regular players and members use and it may save you some time in the decision making process. 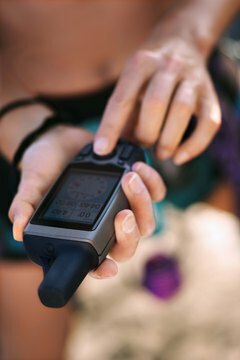 Determine the general types of GPS golf devices you would like to consider. Then, comparison shop for the same models at your local golf discount store, consumer electronics store, and through on-line retailers (find links to some popular sites in the Resources section attached to this article). Many local merchants will offer a better return and/or refund policy than the on-line merchants will for GPS golf devices, but their prices may be higher.